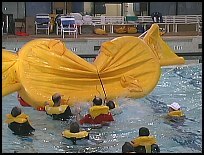 For years, the literature and survival courses have taught that the raft has a 50% chance of inflating upside down. I suspect this is based on military experience with the smaller very basic single tube raft designs they have always used in the past. In my experience it varies a lot depending upon the raft. For example, we have seen a lot more EAM and Hoover rafts inflate upside down than Winslows, which have only rarely inflated upside down, perhaps because of how the valise is constructed and how they pack the raft. In any case, it does happen, so it is something that must be designed for with some means provided to right the raft, or in other words, turn it right side up. The only exceptions are the reversible rafts such as the RFD "R" series and Hoover Type I. In addition, one French manufacturer, Aérazur (a subsidiary of Groupe Zodiac), claims to produce a self-righting life raft, but we were unable to arrange for a test of their products which are not generally available in the U.S.
We turned over those rafts which hadn't inflated upside down to determine the difficulty, if any, of righting the raft. With no wind or weather to deal with, righting was pretty easy for all the rafts, but it was obvious that under real world conditions, some might be much more difficult than others, particularly when dealing with larger capacity rafts. Move around the raft until the wind is in your face, so that the wind will be assisting you, not opposing you (all survivors should relocate to this side of the raft). Rotate the raft around until you locate the righting location which is generally where the gas cylinder is attached to the side of the raft. In most cases there will be some indication, a pictograph or text, that this is the righting location. Grab hold of the righting line if possible (some rafts have only a handle or handles) and use it to assist you to climb up onto the inverted floor of the raft. On smaller rafts simply pulling on the righting line or handle, or doing so while bracing against the side of the raft with your knees or feet, may suffice to pull the raft over. Once up on the inverted raft, place your feet on the gas cylinder, or on the edge of the bottom of the raft, grab hold of the righting line or righting handle, stand up and lean back, pulling the raft over onto yourself by holding onto the righting line or handle. The raft will come over on top of you. Don't panic, the raft weighs little and won't hurt you, and don't let go of the righting line if possible. Maintaining a grip on the line, pull yourself back out from under the life raft. If there is a righting handle, you'll need to let go to work your way out from under the raft. Do not try to right the raft from the side opposite the gas cylinder. When the raft comes over, the hard, heavy cylinder can come down on top of you or another survivor and cause injury. Righting instructions and equipment runs the gamut of none to excellent. SPI's non-TSO'd rafts had neither instructions nor any righting line or grips. This could be a bit of a handful in any sort of adverse weather conditions, though the small size and light weight of the raft do make it easier. By that same token, in any sort of wind these light rafts could be easily blown away from you altogether if you don't have a firm grip on it. On the Type II Survival Products raft, a righting handle of 3/4 inch black nylon webbing is attached to the bottom underside of the single ballast bag in the center of the raft. Stenciled next to the bag is "RIGHTING AID" which can be covered up completely by the ballast bag, depending upon which way it flops, rendering the instruction, such as it is, useless. Even when not covered it may be difficult to see for a survivor in the water. The gas cylinder is attached to the bottom of the floor in this design so it isn't nearly as obvious as on a conventional design where the righting point is and there's no indication on the tube where it could be more easily viewed. Anyone who is short might have significant difficulty reaching the handle from the water and will need to climb onto the bottom of the inverted raft first, which could be difficult. The righting handle on the Survival Products Type I is located on the bottom of the raft to the left of the gas cylinder (when viewed from the water) which is mounted conventionally on the side of the raft. The "RIGHTING AID" stencil is located on the bottom at the edge of the raft. Since it is on top of a double tube raft, it is not very visible from the water. Both rafts were easily righted, but someone without prior knowledge might be at a loss and the instructions on the raft, such as they are, are not much help. 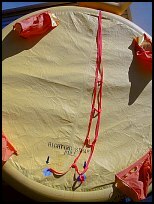 The RFD Navigator had a length of one inch white nylon tape fitted across the bottom of the raft as a righting aid. This functioned adequately because of the small size and weight of the raft and the self-erecting canopy which lifts the raft up off the water to begin with. There are no righting instructions. Hoover and EAM simply note "RIGHTING HANDLE" stenciled adjacent to the single webbing handle affixed to the bottom of the raft. Persons of short stature might have a problem reaching that grip, to say nothing of figuring out the best way to right it. As with the others, there's no indication on the side of the raft nor any useful instructions. 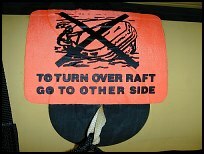 BFG has explicit righting instructions stenciled on the side of the raft, designed to be read when the raft is upside down, "PULL STRAP TO UPRIGHT," but no pictograph. On the opposite side is stenciled "RIGHT FROM OTHER SIDE." BFGoodrich has a single one inch red nylon webbing line with two hand loops sewn into it running from one side to the other. The hand loops lay flat and were not all that easy to grab hold of as a result. This is one area where the rectangular shape might be expected to have an advantage, making it easier to right than it would be otherwise, but it turned out not to be the case. However, the four person presented a related problem. Because of the small diameter of the single hoop self-erecting canopy support, it did not lift the raft off the surface when it was upside down. As a result, a mild vacuum effect was produced while trying to right the raft that made it difficult to accomplish without assistance or without breaking the seal" first, something a survivor might not be expected to know or figure out right away. I suspect this is apparent because of the relative depth, from the double tubes, to the surface area, since we never had similar problems with single tube rafts without canopies. Air Cruisers uses two different righting systems. On the 4-person there is a bright blue 1-inch nylon webbing line running across the bottom of the raft with loops sewn into the line at intervals so you could use then to grasp onto the line easier, a concept that originated with Winslow. While there are no instructions on the side of the raft, those stenciled on the bottom are reasonably adequate. On the 13-person raft they have incorporate a righting ladder (which was first proposed by ETS editor Doug Ritter here on ETS in the 1996 review and heretofore only offered by Winslow as an option on their aviation line, it is standard on some marine rafts). Air Cruisers implements this concept as a triangular ladder constructed of red 1-inch nylon webbing. The righting location is to the left of the gas cylinder (when viewed from the water). This is in line with the inflatable entry on the other side. The instructions and arrows make it fairly clear what needs to be done, assuming they can be read, and the ladder design makes it a cinch to pull the large raft over by easily grabbing hold of the ladder rungs. Lack of indication of righting location on the side of the raft or any instructions is a definite drawback. Winslow has incorporated another suggestion first published in the 1996 ETS review. Their rafts now have a unique "righting locator light" situated under the raft at the edge adjacent to the righting line at the righting location. This light, the same as is used on the top of the canopy and on life vests, guides survivors to the raft and to the righting location at night and provides some minimal illumination to see the righting instructions and righting aids. The water activated battery can be retrieved from the water and secured so it doesn't serve to attract fish or other critters. An instructional placard is attached to the Velcro loop used to secure the battery, but it isn't all that obvious and it might be better to have a conspicuous placard someplace else. In any case, we think the righting locator light is a great idea (it was ours after all) and we like how Winslow has implemented it for the most part. Winslow has also definitely gone the extra mile with regards righting instructions, far surpassing anyone else. 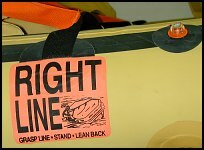 At the righting location on the bottom tube (top tube when the raft is inverted) is a bright orange placard with a bold "RIGHT LINE" (as opposed to the wrong one?) next to a pictograph showing a raft being righted. Underneath are clear instructions to "GRASP LINE - STAND - LEAN BACK". The righting line and placard are located directly over the gas cylinder. On the opposite side of the raft is another bright orange placard with the same pictograph, but having a big "X" through it and instructions "TO TURN OVER RAFT GO TO OTHER SIDE." Responding to a criticism from the last review, Winslow have changed their formerly all black righting line. The black two inch wide nylon strap runs from one side to the other with loops along its length to grab onto. These handholds are now made of orange webbing and stand out clearly from the black. In addition they are also twisted so they don't lay flat, making them much easier to grab hold of. Not quite as easy as a ladder rung, but much better than anything else. The 12-person Ultima was equipped with Winslow's excellent optional righting ladder ($75) which is also constructed of 2-inch black webbing with 2-inch webbing orange rungs. The righting ladders used by Air Cruisers and optionally by Winslow are really a huge step up in ease of use (nobody said I had to be modest), especially so for larger rafts or poor conditions. As long as we're dealing with upside-down rafts, Winslow deserves kudos for being the only aviation raft company to apply retro-reflective tape to the underside of the raft. This is a SOLAS requirement for good reason. Even the best life raft can be capsized under the right circumstances. At times the best thing to due under those circumstances is to just leave it that way until conditions improve (though air supply can become a problem over longer periods on some rafts). In any case, the retro-reflective tape makes if far easier for SAR to locate raft at night. 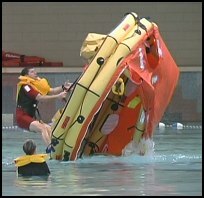 No righting aids are included with the RFD "R" series raft since it is a reversible raft. However, in a promotional tape supplied with the raft, it does discuss the possibility of the raft overturning and needing to be righted in a conventional manner. This could occur if it overturned while there were survivors inside and the canopy had been erected. It is demonstrated with the "survivor" using the inside grab lines as righting aids. We did not test this, but it should work. Bottom line on righting a raft is that it is relatively easy for anyone with experience and, in our experience, a lot more difficult for anyone who hasn't received prior instruction. They just don't seem to be able to figure out how to do it. Only Winslow really deals with this issue satisfactorily with their righting light, very good righting aids, and excellent righting placarding and instructions. Air Cruisers' righting ladder on the larger raft is a very good start, but they fall down in the placarding and instruction area.